I have been researching my family history for quite a number of years. I thought it might be helpful to others who are just starting out, if they had a few tips and websites to start on their journey. A good idea is to ‘Google’ family search, which will bring up many websites. Some sites have a system where people will search for you if you give as much information that you know. It is nice to remember to thank them for their time. Sometimes it is best to work backwards from your parents/grandparents birth/marriage certificates, where you will find the fathers name also the female’s maiden name. Websites I have found useful are www.familysearch.org this is a Mormon website and it is free. There is www.friendsreunited.co.uk which is free to look, but you need to register. On the site www.genesreunited.co.uk there is a yearly fee, but it is well worth joining. They have census and records; look up message board, and also a surname search board. The Commonwealth War Graves Commission www.cwgc.org is a free site. For ancestry.co.uk there is a yearly fee. The latest available census for 1911 is pay to view. I do hope you find this helpful and wish you the best of luck with your research. Don’t forget that if you have any questions that you would like to post here, you can do so on our very lively and informative Message Board. I also recommend looking as much as possible at your own family resources. It is a good reason for getting back in touch with family, especially older members. Look at old letters, cards, photographs (many can be dated from the excellent Sussex Photographic website). I have been lucky in that my grandmother and mother kept lots of old material. From notes on photographs and letters home, I pieced together family that emigrated from Sussex to Canada. One of my contacts overseas also inspected an old family Bible with lots of information back to the 1600s with details of a change of name of one branch of the family who came here from Holland. The need for the change of name was down to religious persecution. http://www.historicaldirectories.org/hd/index.asp for Kelly’s and other directories. http://www.curiousfox.com for linking with others searching for the same family details. http://www.gro.gov.uk/gro/content/certificates is the cheapest way of getting certificates. There are many others and searching for your own family name on Google can be productive. Finally do not overlook the Sussex Family History Group and other counties with similar organisations. They may have CDs available of weddings, baptisms, deaths etc going back quite a long way. Good luck. It can be just like an investigation. It is good to put photographs to names and you may be able to swap with family that you discover. Be prepared for good and bad to come out but remember that things will have been different 100 or more years ago. I have got back to the 17th century so far and have found it useful to create a timeline as it adds interest to the information and informs one on what would have affected the particular generation of the time. And you correspond with some interesting people. Recently I had exchanges with a lady in Australia: temperatures were well below zero here but over 35 there. Hi Dennis. I also had so many photos, some people I didn’t even know who they were. My mum’s brother (my uncle) who is 95 this year, didn’t recognise anyone in the photos, so they had to be from my dad’s side of the family or friends. I set up a website with the unknown photos, there is a link to it on this site “Brighton people”. I found relations in Canada and Australia. Also with the 1911 census, I found there were more children born between the 10 years from 1901, now some of the photos make sense. It’s a great hobby, I have eased off a bit from searching at the moment: I have so much information on computer, in folders and files. I am at the moment putting everything on to disc for the family. I think the saddest I came across was my dad’s aunt and uncle who were taken into Barnardos care and sent to Canada after their father died, one stayed in Canada, married and had a family. I have been in touch with the grandson for the past three years. The aunt came back from Canada to Brighton, in very bad health and died aged 22. I had to pay Barnardos £50 for a copy of the records (very sad reading), also photos of the two children at the age of 5/6. There were also photos of the aunt when she was in service aged 18. The Taylor and Gunn fishermen families of Brighton were the easiest of my family to research. Thanks for adding more to the website, I didn’t want to bombard people with so much information all at once, there is so much information to take in when you first start researching your family. I’ve been reseraching my family tree for many years, I started when the 1901 census came online. Since then I’ve opened up a treasure chest of information including finding a brother and sister of my grandfather that no-one knew he had. So many people are helpful amongst genealogists and a site I’d add to the mix is: http://www.rootschat.com – really good community and loads of information. Familysearch.org is free and gives you the 1881 census and IGI’s for free too. 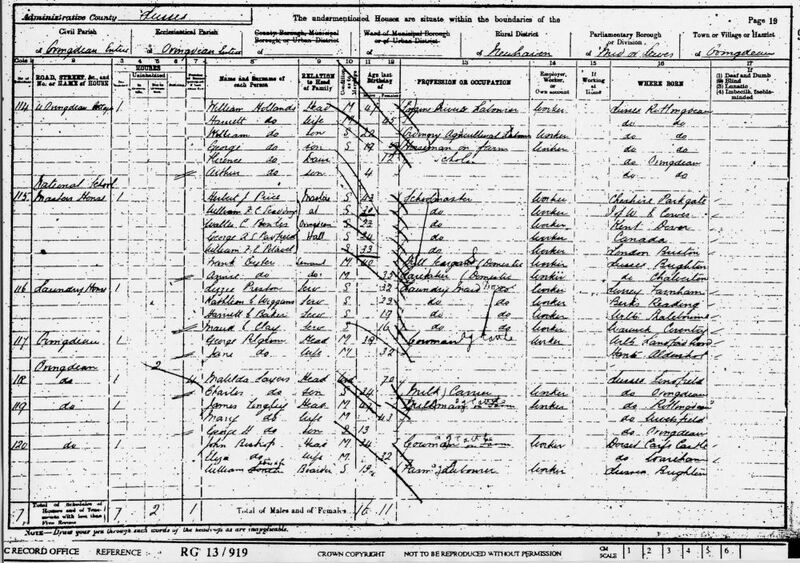 Ancestry.com is good because it has all the info in one place, including the 1901 census. 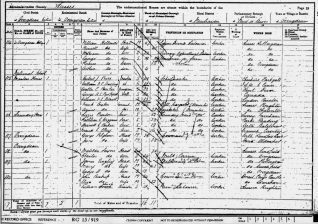 The 1911 census gives you much more recent information, so can connect the dots sometimes! I’ve only found this site recently, but I’m hoping it can help me to solve the next chapter in discovering my history.